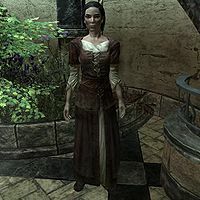 Erdi is a Nord maid living in the Blue Palace of Solitude. She is involved in the quest The Mind of Madness, where she provides you with the key to the Pelagius Wing of the palace. Erdi wears a set of farm clothes along with a pair of boots. She carries a belted tunic along with a selection of lower-class items and gold. When approached, she will greet you with "Oh, hello! Just tidying up." She may also tell you, "So exciting when new folk come into town. I bet you've had plenty of adventures." If your character is female, Erdi will talk idly about her aspirations: "Maybe you need a partner? Hmm? Just picture it. Two women, the dusty road, strapping men at every tavern, a fortune in gold to be claimed..." or "Someday, I'll be a gallant heroine. You make it look so.. appealing." If your character is male, she will keep talking about her dream for a chivalrous hero to arrive and take her away: "Are you my gallant hero? Have you come to whisk me away, to a life of adventure and romance? ", "I made a wish in the town well that a golden knight came to take me to his castle. Oh, does it spoil the wish if I tell? ", or "Someday, a gallant hero will ride up and take me away. Someday..." Despite this misleading dialogue, she cannot be married or become a follower. Telling her that you need to get into the Pelagius Wing will have her reply, "Oh, I'd get in trouble for that. It's not allowed. Besides, it's scary in there!" You can try to persuade her by telling her that Falk asked you to check it out, and she'll change her mind: "Well... I suppose in that case, it's okay to let you in. But only briefly. Be careful, and come right back!" She will then give you the key to the wing. This page was last modified on 10 June 2014, at 13:49.